Egypt's President Abdul Fattah al-Sisi has vowed to respond with "the utmost force" after 235 people were killed at a North Sinai mosque during Friday prayers. The al-Rawda mosque in the town of Bir al-Abed was bombed and fleeing worshippers were then gunned down. The Egyptian military has said it has conducted air strikes on "terrorist" targets in response, reports BBC. 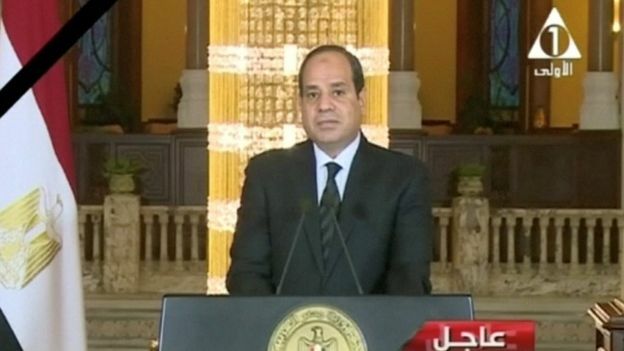 "What is happening is an attempt to stop us from our efforts in the fight against terrorism," Mr Sisi said in a televised address hours after the attack. "The armed forces and the police will avenge our martyrs and restore security and stability with the utmost force." An army spokesman said "terrorist spots" where weapons and ammunition were reportedly stocked had been bombed by air force jets on Friday in response. Mr Sisi, the former head of Egypt's armed forces, has emphasised national security and stability during his time as president.